Figure: Grp78/BiP ELISA Kit from Enzo Life Sciences, Inc.
Enzo Life Sciences expands its offering of unique ELISAs for protein homeostasis (proteostasis), neurodegenerative disorders and cancer research with the introduction of a first to market, high-sensitivity Grp78/BiP ELISA Kit. Grp78/BiP is an endoplasmic reticulum (ER) specific homologue of (Hsp70), serving as a critical stress-sensing chaperone and regulator of the unfolded protein response (UPR). Grp78 functions to help fold misfolded proteins to prevent protein aggregation, and helps regulate protein degradation, synthesis, transportation and oligomerization. The critical role of ER-stress regulating proteins in maintaining proteostasis, inducing macroautophagy, and the expression of Grp78 on the surface of some tumor cells, makes Grp78 and the UPR pathway a potential target for neurodegenerative and cancer therapies. This quantitative ELISA kit offers sensitivity to enable quantification of both normal and upregulated levels of Grp78/BiP, detecting as little as 8.4 ng/ml of Grp78/BiP in human, mouse and rat cell lysates or serum samples. The assay provides quantitative results with excellent reproducibility between experiments, offering efficiency over Western blotting by requiring less sample input, and analysis of up to 40 duplicate samples in just 2.5 hours. Like all Enzo Life Sciences ELISA kits, the Grp78/BiP ELISA kit is complete, flexible, and put through rigorous fit-for-purpose validation and stability testing to ensure high precision, accuracy, sensitivity, and specificity. It is supplied with an easy-to-follow protocol, pre-coated microtiter plate and liquid color-coded reagents to save the user time and reduce errors. The 96-well break-apart strip plate design provides throughput flexibility to minimize waste. The Grp78/BiP ELISA kit is the most recent addition to Enzo’s industry-leading portfolio of products for heat shock protein, oxidative stress, autophagy, and proteostasis research. 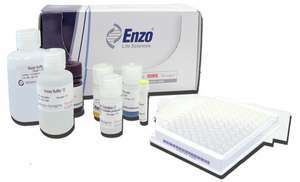 For more information or to order the Grp78/BiP ELISA Kit or other Enzo Life Sciences products, please visit us at www.enzolifesciences.com or call us at 1-800-942-0430.